Hearthstone Cookbook: the Innkeeper's Tavern Available Now | Nerd Much? Hearthstone: Innkeeper’s Tavern Cookbook is the ultimate selection of recipes for any fan of the game. Draw your cards, sit down, and taste some of these cocktails and snacks adapted from the game. This is the same author that wrote World of Warcraft: The Official Cookbook and A Feast of Ice and Fire: The Official Game of Thrones Companion Cookbook. 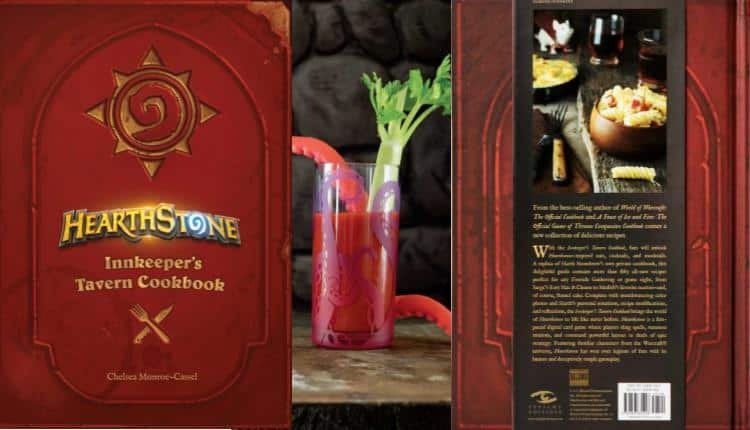 Inspired by the private cookbook of one Harth Stonebrew, some examples of the recipes inside the Hearthstone cookbook are Sarge’s easy Mac and Cheese, Polymorph Puffs, Blood of the Ancient One, and Starseeker Sour. Each recipe is coupled with a beautiful photograph of the dish and Harth’s personal notes. Like for Blood of the Ancient One, he crosses out “1 tablespoon wasabi” with “1 teaspoon wasabi.” The recipe still makes for a fairly spicy Ceasers, but I imagine 1 tablespoon of wasabi would be a little much even for the best of us – unless you have a fever or cold you want to get rid of, of course. Fun fact, wasabi (made from a particular ginger root) was used for Japanese street food, built into the recipe of most sushi and maki, as a kind of anti-bacterial that killed off any bad bacteria that might be present from poorly kept raw fish. As such, wasabi has been a staple of Japanese cuisine ever since. With such a long history as an anti-bacterial, using a teaspoon (or tablespoon) of wasabi in the Blood of the Ancient One is sure to kick your health bar into high gear. Needless to say, all of the recipes in Hearthstone: Innkeeper’s Tavern Cookbook are perfect to feed your Hearthstone (or any tabletop game) group. Everyone knows a drunk Hearthstone session is always the best one. If you want your players focused, keep the snacks coming with the bite-sized recipes in this book.